Freelance Camp Manila 2013: Get P500 off! Attend the Freelance Camp Manila 2013 and know everything you need to know to start and sustain your own freelancing business! Are you a freelancer? Consultant? Work-at-home mom? Solopreneur? Whether you're a designer, writer, programmer, photographer, accountant or virtual assistant, you still face challenges working for yourself, right? You may even find yourself struggling at times to make this work. If so, Freelance Camp Manila is your best bet to help you! Benefit #1: You will learn how to transition successfully from employee to freelancer or solopreneur. Benefit #2: You will find out the different income streams you can develop and earn from as a freelancer. Benefit #3: You will discover the secrets of getting to the top of online freelance marketplaces. Benefit #4: You will see how you can manage your finances, tackle taxes, and deal with clients. Benefit #5: You will be inspired by success stories of successful freelancers who are enjoying time, location, and financial freedom. Freelance Camp is a gathering of freelancers and coworking professionals that happens across the US, Europe, and Asia. It’s an intensive 1-day event for independent professionals to share and and learn in an open environment. Introduced for the first time in the Philippines and Southeast Asia, Freelance Camp features a mix of freelance marketplace executives and veteran freelancers who will share success stories and strategies to help you turn your freelance career from struggling to thriving. The one-day conference will happen on October 3, 2013, 10:00am-7:00pm, at SM Megatrade Hall, Mandaluyong City. Who should attend Freelance Camp Manila? 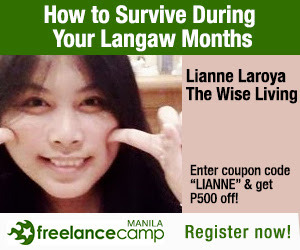 - Enter the coupon code "LIANNE" to get additional P500 off!